Before starting to use Frontify, an old brand management software with lacking workflow prompted Vodafone to implement new software. They wanted a platform that was modern and accessible. As a future-oriented company, Vodafone required something that simplified brand management for all stakeholders and allowed a higher working pace. In the Düsseldorf headquarters, we met with Julia Arnold and Christoph Hauser. They're the identity and group manager for brand communications at Vodafone. These two inspiring professionals told about the implementation of the Frontify platform, and how it transformed their organization. "As we started using Frontify, we could immediately benefit from a much faster onboarding, integrating our internal and external stakeholders in the process through an interactive platform holding all our media assets in one central place." While striving for simplicity and a centralization of their brand management, Vodafone had scavenged the market, looking for a complete solution through several software analyzes. They finally found Frontify after recommendations from their CI and UX-working colleagues. With the new centralized branding hub, they could boost the linkage between communications departments and external CI agencies. Frontify intensified the shareability and usage of brand guidelines both internally and externally. Thanks to the new and uncomplicated search process, optimized templates, assets, and an improved quality of the product, Vodafone was able to take their brand work from high class to world class. 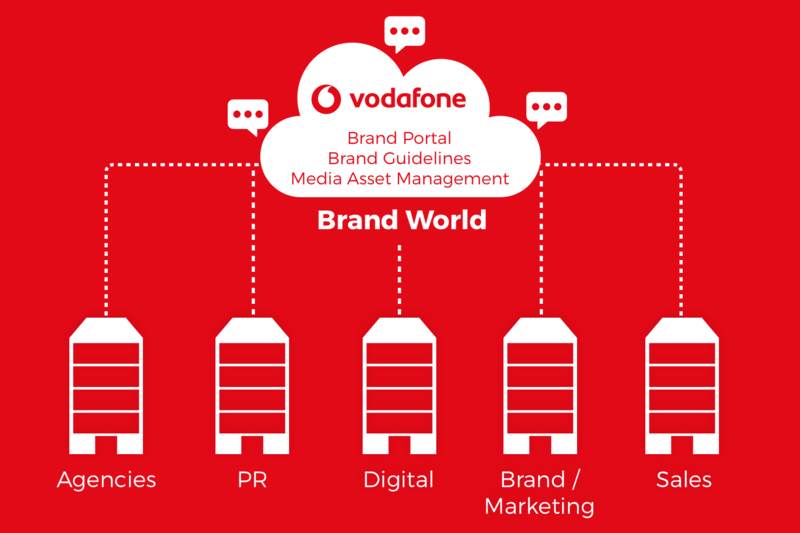 By including a central platform such as Frontify, Vodafone could profoundly increase consistency and improve their workflow with branded media and design. 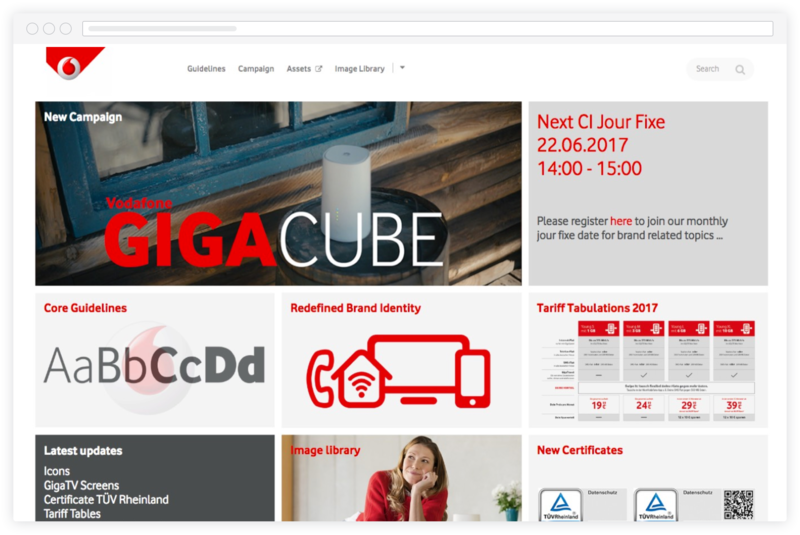 The Frontify Brand Portal and Image Library, providing a fully responsive and customizable interface, currently sits in the core of the Vodafone brand. From here, the entire organization can gather and rework information and assets connected to their brand world – but also attain news and other things relevant to the enterprise in whole. "Frontify allows us to continuously cooperate with over 40 different external partners, a total of 500 people, through the same platform. The way that weʼre now sharing brand guidelines via our new Brand Portal has never been more easy and accessible." Now, Vodafone is further centralizing their Brand Portal, improving the image and video production, and implementing Frontify Workspace for project teams. 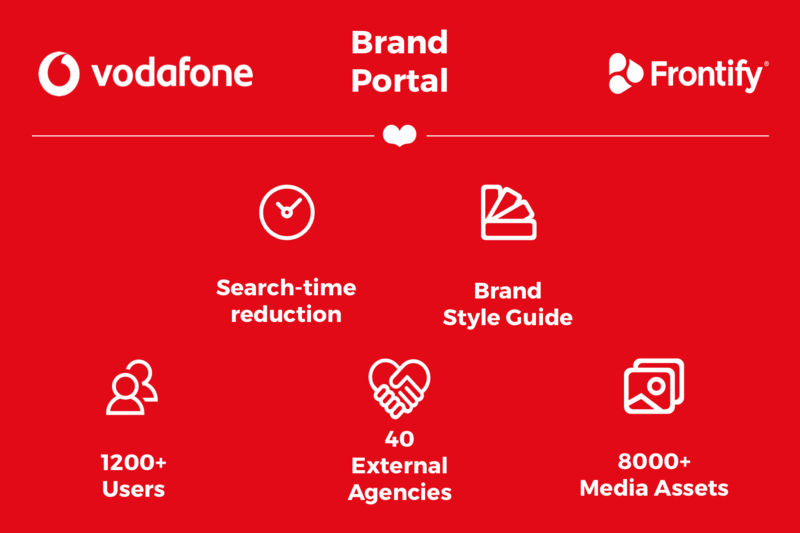 With over 1200 Frontify users, Vodafone has widely revamped their creative process, making the push-outs quicker and more qualitative, through enhanced cooperation tools and cloud-based brand assets.